Stenciling is one of the most inexpensive, creative, and easy paint techniques you can use to dress up your home. 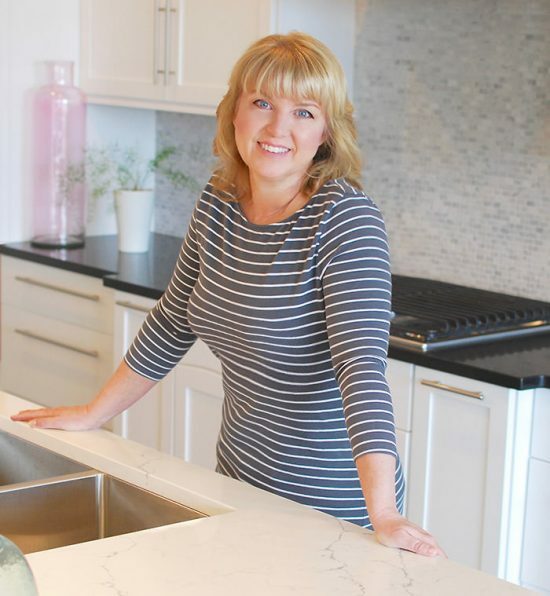 It can be used in any decor from Paris chic to contemporary to traditional, and can be used on many surfaces other than the walls. Here is a quick primer on how to stencil, along with a list of creative ways to use stenciling in your home decorating. 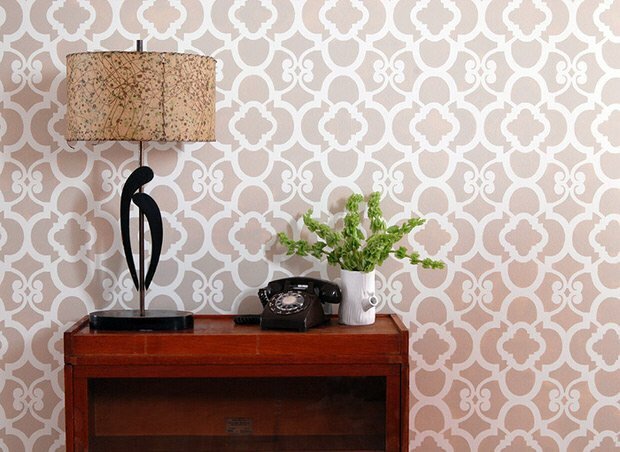 Our featured project, above, is stenciled wallpaper by Eat, Knit, DIY! Lots of step by step photos. I prefer to use a stencil brush in most of my stenciling. It is a short, fat, stiff brush that you pounce the paint on with. This keeps the paint from leaking under the edges of your stencil, smearing the design. Some decorators also use sponges to dab on the paint as well. Any kind of paint can be used for stenciling. I use craft or house paint. If I stencil fabrics, I mix the paint with a textile medium in a 50/50 ratio. You can get textile medium at any craft store, its kinda like a milky thin paint sold in the craft paint section. 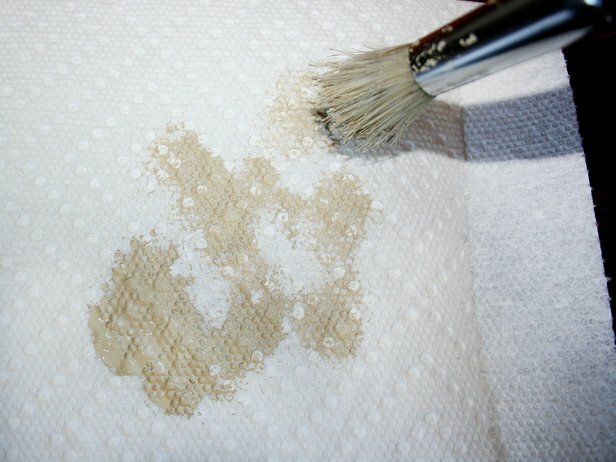 The trick is not what kind of paint you use, its to only use a LITTLE! Less is definitely more in this case. You can use as simple or elaborate stencil as you choose, and you can make it or buy it. To make a stencil, simply draw a simple design on a thin sheet of cardboard or acetate, and cut out with a craft knife. Cool stencils are available at the discount and craft store for just a few dollars, or you can go all the way up to specialty stencil shops that sell whole wall murals for a few hundred dollars. (Still way cheaper than paying an artist, but not in MY budget!) I find the craft shop pre-made stencil perfectly acceptable for doing a room, and often you get several coordinated stencils in one pack. 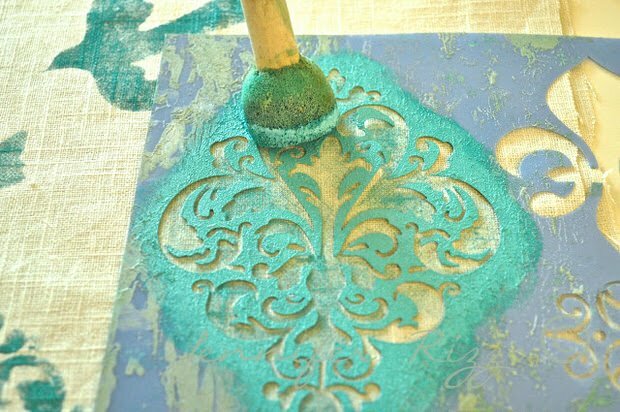 Place your stencil on the area you want the design, and hold in place with a little masking tape or stencil spray. 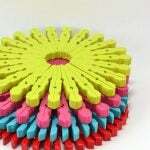 Now pour a little paint onto a plate, and dip just the tips of the bristles of the brush into the paint. Now pounce the brush onto an empty spot on the plate or a paper towel to get rid of excess paint. Remember, you just want enough paint to leave color, a very dry brush. 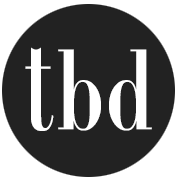 Now using a pouncing motion, pounce the area inside the stencil cut out until it is completely painted. You are not looking for an opaque look here, you want it to look textured, remember, less is more. Remove the stencil, let dry for a moment, then move on to the next area to be stenciled. Most store bought stencils have a mark to help you line up the next stencil placement if you are doing a continuous design. Want some great, creative (and up to date) ideas for how you can use stenciling to customize your home? Create a pattern on the wall like wallpaper. See how HGTV creates a focal wall with stencils. 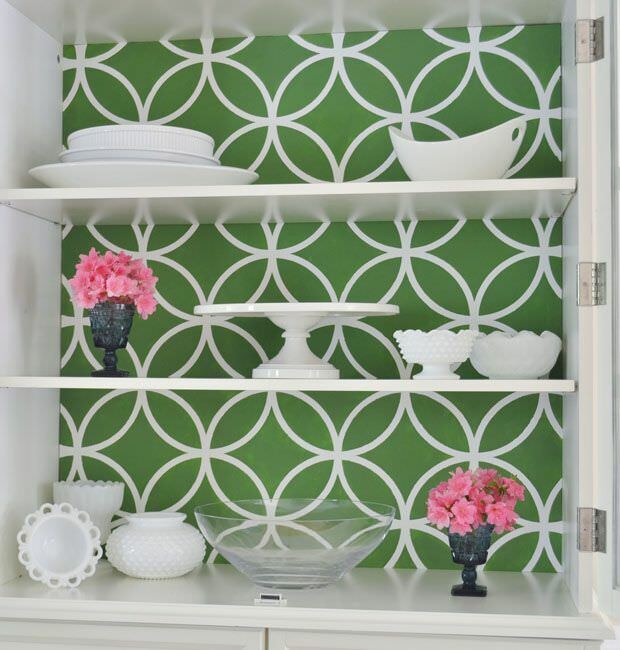 Stencil an element onto the front of your kitchen cabinet doors. Check out this tutorial on how to stencil a cabinet by Burlap and Blue. 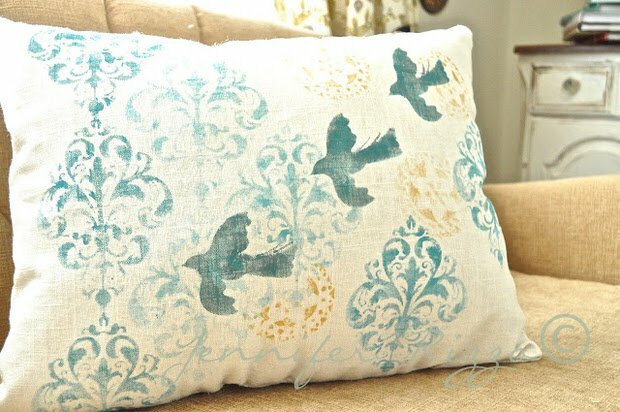 Stencil the edge of your sheets in the bedroom, your shower curtain or stencil your pillows, as in Jennifer Rizzos tutorial on her linen pillows. I love the delicate look of this project! Stencil an area rug for (or right onto) the front porch. 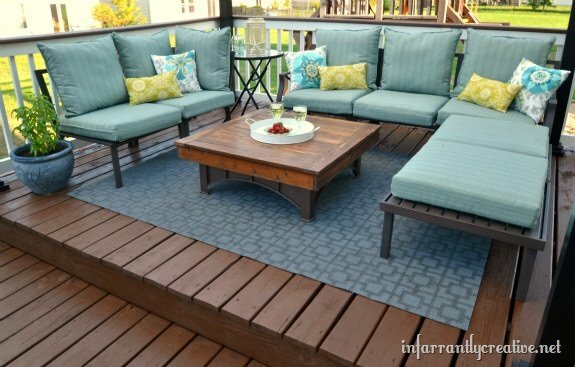 Read this tutorial by Infarrantly Creative on her porch makeover with an outdoor area rug. Stencil your wooden floors. 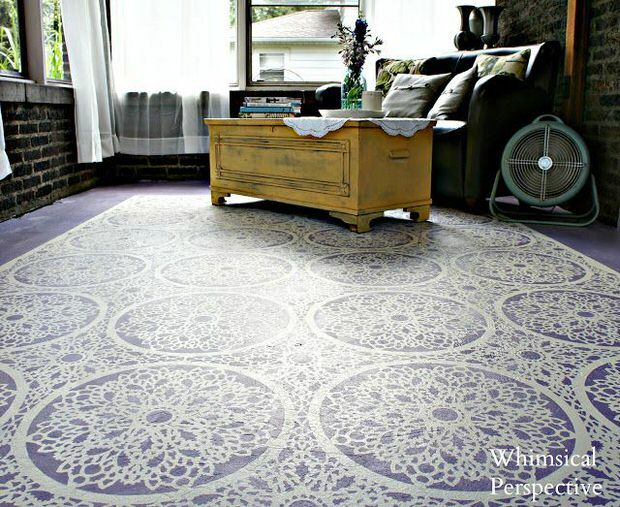 Whimsical Perspective has a step by step for you on how to stencil your floor. 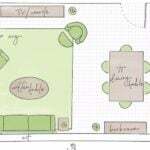 There’s was done on a concrete porch floor, but it would work on any hard surface floor. Remember to prime! Only your imagination limits the creativity you can display with stenciling. So what are you waiting for?